WinUI gives you many of the latest Windows UX platform features, including up-to-date Fluent controls and styles, available in a way you can use right away, backward-compatible to Windows 10 Anniversary Update (14393). The XAML Controls Gallery gives you samples to explore all the cool new features added to the library. You can choose to use the WinUI packages in your app using the NuGet package manager: see Getting Started with the Windows UI Library for more information. WinUI is an open source project hosted on GitHub. We welcome bug reports, feature requests and community code contributions in the Windows UI Library repo. Use an ItemsRepeater to create custom collection experiences using a flexible layout system, custom views, and virtualization. Unlike ListView, ItemsRepeater does not provide a comprehensive end-user experience – it has no default UI and provides no policy around focus, selection, or user interaction. Instead, it’s a building block that you can use to create your own unique collection-based experiences and custom controls. It supports building of richer and more performant experiences. The AnimatedVisualPlayer hosts and controls playback of animated visuals, enabling you to add high performance custom motion graphics to your app. For instance, the AnimatedVisualPlayer is used to display and control Lottie animations. TeachingTip provides an engaging and Fluent way for applications to guide and inform users with non-invasive and content-rich tips. TeachingTip can bring focus to new or important features, teach users how to perform tasks, and enhance workflow by providing contextually relevant information to your task at hand. It is the ability to have 'Radio Button' style options in a MenuBar. This allows for groups of options with bullets which are tied together like a radio button group. The logic is handled for the developer. Compact mode enable developers to create comfortable experiences for any number of scenarios. Simply by adding a resource dictionary your application can fit on average ~33% more UI. Creating a visual hierarchy of elements in your UI makes the UI easy to scan and conveys what is important to focus on. Elevation, the act of bringing select elements of your UI forward, is often used to achieve such a hierarchy in software. 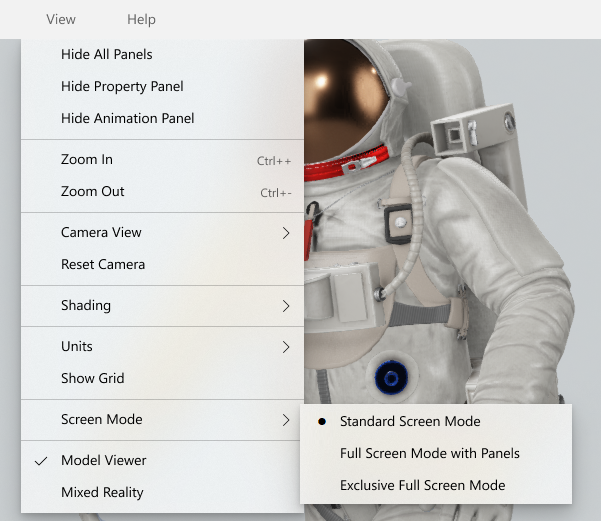 With Windows 10 May 2019 Update, many of our common controls add elevation by using z-depth and shadow by default. The NavigationView and TeachingTip controls in WinUI 2.1 will also have default shadows when running on an OS with Windows 10 May 2019 Update. The full list of controls that have default shadows and how to use additional APIs will be available once the Windows 10 May 2019 Update is released and the link will be posted here. CompactDensity : Compact mode enable developers to create comfortable experiences for any number of scenarios. Simply by adding a resource dictionary your application can fit on average ~33% more UI. Shadows : Creating a visual hierarchy of elements in your UI makes the UI easy to scan and conveys what is important to focus on. 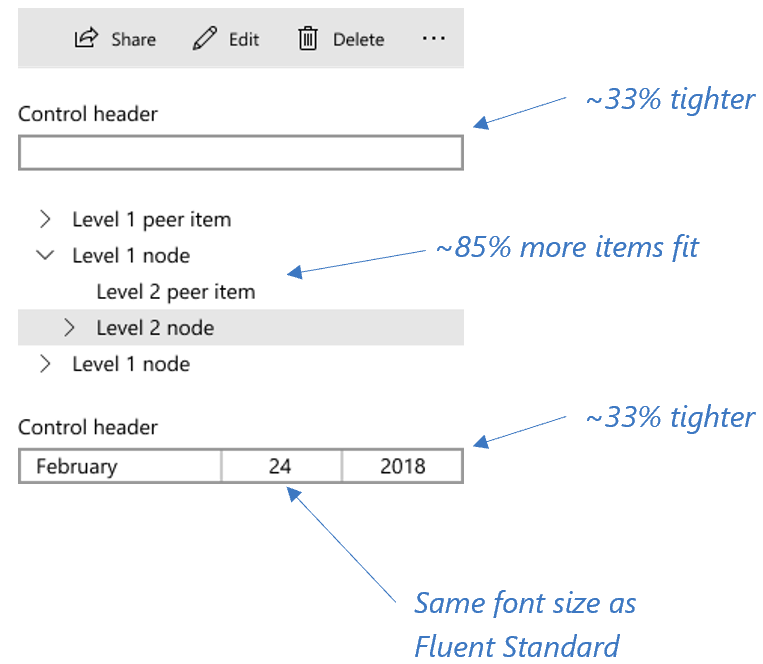 Elevation, the act of bringing select elements of your UI forward, is often used to achieve such a hierarchy in software. Many of our common controls add elevation by using z-depth and shadow by default. This new control provides a way for your app to guide and inform users in your application with a non-invasive and content rich notification. TeachingTip can be used for bringing focus to a new or important feature, teaching users how to perform a task, or enhancing the user workflow by providing contextually relevant information to their task at hand. This new control enables playing complex high performance vector animations, including Lottie animations created using Lottie-Windows.